Many people say hitting a baseball is the hardest thing to do in sports. I would have to agree. If you have ever played golf you know how hard it is to hit a golf ball correctly, and the golf ball isn’t moving. 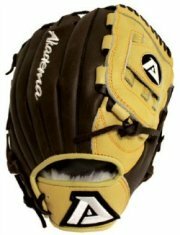 The baseball is being thrown towards you, and maybe even at you. There is less than a second to hit it or get out of the way. Yes, hitting a baseball is hard. After reading that you understand why you have to have good batting mechanics. You cannot be thinking about your swing or any other part of your hitting mechanics and have success. The only thing you want to be thinking about is hitting that baseball, not how to bat. Hitting coaches argue about which is the right way and the wrong way to swing a bat. There is only one right way, the way that works best for you. Everybody is different, so all baseball swings will be different. Short swing vs. long swing, open stance vs. closed stance, and short stride vs. long stride, find the style that works for you. OK, here are some detail instructions on a baseball swing from start to finish. I’m only giving you these instructions to get you started out. Or maybe you are having a little trouble hitting, and want to try something new. 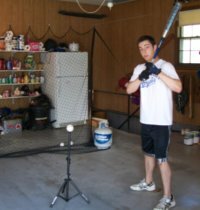 So check out these mechanics of hitting a baseball and then keep working on your swing until you are comfortable and are hitting the baseball. Stand in the batters box right across from home plate. In later years you may want to move up when a pitcher is throwing breaking balls, or you may want to move back when the pitcher is a fastball pitcher. For right now the middle of the batter box is good. So how close should you stand near the plate? Be sure you can reach the outside corner of the plate without leaning over. Extend your arms out with the bat in your hands and see if you can touch the outside corner. If so, OK. If not, then move in closer. Your feet should be spread a little more than your shoulder width. If your feet are too close together or too far apart, you will have trouble with your balance. Slightly bend your knees, just enough so you feel comfortable. Keep your head steady, looking at the pitcher. Hold the bat away from your body, with your hands about shoulder height. Your elbows should have a 90 degree bend, spread apart, and your arms should be relaxed. The grip on the bat should be firm, but not tight. Everything should feel comfortable and loose. You will hear parents at a little league baseball game tell their kids to get ready to load up. As the pitcher begins his windup, the batter starts to shift his weight more to the back leg. Some batters will even slightly lift their front leg, or straighten their front knee. But be sure during the load to maintain a good balance,hold the head steady, and to keep the hands up and back. You are getting into the best position to take a strong swing at the ball. As you start your swing the front foot will be firmly planted on the ground. You now throw your hands at the ball, while not letting your front shoulder fly open. Your weight shifts forward and the hips rotate. Be sure to keep your head down and your eyes on the ball. The arms will be fully extended at or just after contact with the baseball. 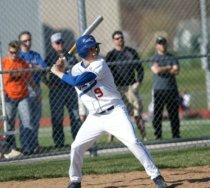 Continue on thru your swing after hitting a baseball. Your wrist will roll over and you want your head to stay down (this forms a good habit of not taking your eyes off the ball too soon). You finish the swing, look up for the ball, and take off for first. 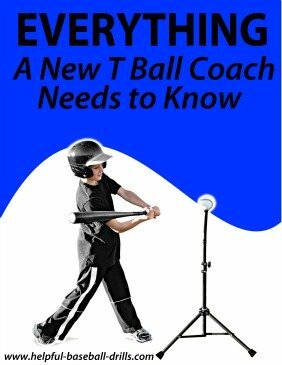 You have just completed a correct swing with good batting mechanics. Again, the key to hitting a baseball is to find a swing that is comfortable, and that works for you. This is the first step in how to bat.